More of Britain’s exports and imports go to and come from the EU Single Market than any other area in the world. It’s our most important, most lucrative, most vital international market for transacting business, upon which our country’s wealth depends. Nearly half of our exports go to the EU Single Market, and just over half of our imports come from the EU Single Market. Nowhere else in the world comes anywhere close to that. Nowhere else in the world can get anywhere close to that. ① Brexiters claim we should abandon EU membership so we can trade with the rest of the world. But that’s nonsense. We trade with the rest of the world now. The EU does not stop us. ② Brexiters claim we should abandon EU membership because other areas in the world are growing faster than the EU. But that’s nonsense. We trade now with faster growing economies. The EU does not stop us. ③ Brexiters claim we should abandon EU membership so that we can strike our own trade deals with other countries. But that’s nonsense. Through the EU, we benefit from the best trade deals, because the EU as a club of 28 countries has the size, the muscle and the clout to negotiate the best trade deals for its members. On its own, the UK won’t be able to strike deals anywhere near as good as, let alone better than, the ones we already have now through the EU. It will take us many years to replace excellent EU trade agreements with inferior ones. ④ Brexiters claim we should abandon EU membership because we don’t need free movement of goods, services and capital across the EU. But that’s nonsense. Easy, borderless, tariff-free trade across our continent is vital for British businesses and British jobs. If we lose frictionless access to our biggest and best customers and suppliers across our continent, our economy will seriously suffer. ⑤ Brexiters claim we should abandon EU membership because they particularly don’t like free movement of people. But that’s nonsense. Without free movement of people across the EU’s Single Market, our services industry, upon which 80% of the UK’s economy depends, will slump. Without free movement of people, British businesses will lose easy access to workers across our continent, to do the jobs that Britain simply doesn’t have enough Britons to do. What’s more, our workers will lose easy access to the world’s biggest and best jobs market. 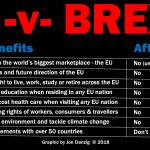 And Britons will lose the right to live in other countries across the EU on preferential terms. ⑥ Brexiters claim we should abandon EU membership because they don’t like EU rules that govern trade across the EU. But that’s nonsense. Without a common rule book covering safety, quality, guaranteed standards and business practices, chaos would ensue between businesses across our continent. Vital protections of workers and consumers in Europe would be lost. The safety of our continent’s people and environment would be put in jeopardy. ⑦ Brexiters claim we should abandon EU membership because they want the UK to make its own laws and rules. But that’s nonsense. Most laws for our country are already made in our country. But rules and laws covering how we transact business across our continent need to be agreed by countries across our continent. In the EU, the UK has a say and votes on those rules and laws. Outside the EU, we’ll have no say and no votes on those rules and laws, but we’ll still be subject to them, and just as affected by them. The UK currently benefits from two single markets. Our country’s single market. And our continent’s single market. They both operate in the same way and on the same principles. Free movement of people, goods, services and capital between England, Scotland, Wales and Northern Ireland form the basis of our union of the four countries of the United Kingdom. It’s our single market. It’s the glue that keeps us together. Enabling people, goods, services and money to move without borders or restrictions across the United Kingdom is what makes us a functioning unity. It’s helped to make the UK one of the world’s richest and most successful countries, with common standards, values and history. Free movement of people, goods, services and capital work together. They cannot be separated without causing discord and disorder across our nation. Mess with just one of the four freedoms and our union of the UK would come undone. 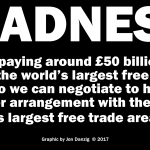 Not only business and employment would be affected, but peace and stability would be put at risk if we could not have the freedom to move, to do business, to trade, to send money, without friction, across and between our four countries of the UK. It’s the same with EU. The EU functions as a cohesive single market of 28 countries, just as the UK functions as a cohesive single market of four counties. The EU Single Market is the glue that keeps European nations together. It has helped to make Europe the richest and most successful continent on the planet, with common standards, values and history. 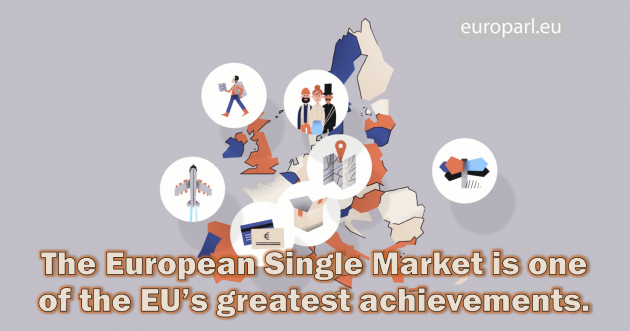 The UK’s Single Market, and the EU’s Single Market, both represent significant achievements. They work. But there’s one vital difference. 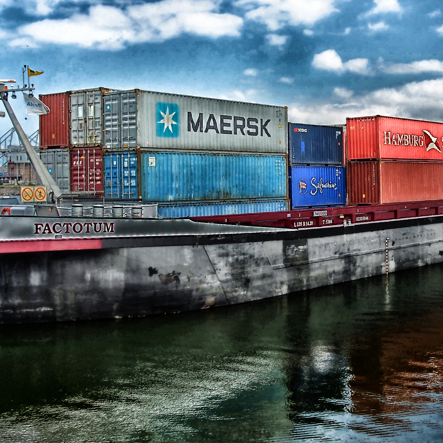 Free trade between the four countries of the UK is vital to our smooth functioning as a nation. But doing business with each other doesn’t make the UK significantly richer. To do that, we need the UK to export our goods and services (and we export far more services than goods). 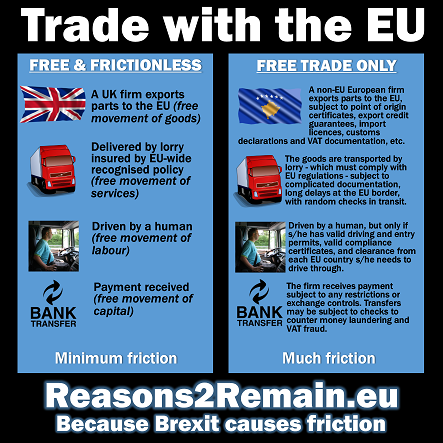 Doing frictionless trade with other EU countries makes Britain richer. Exports to the EU bring us prosperity. If we lose borderless, lowest-cost trade with our most important customers and suppliers right on our doorstop, Britain – and Britons – will be poorer. Our exports to the rest of Europe bring us wealth. Yes, exports to countries outside the EU also bring us wealth. We need both. In the EU, we have both. 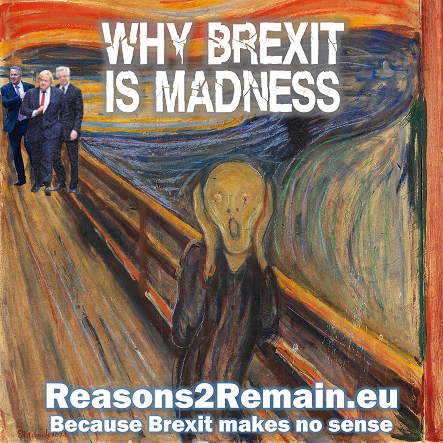 This entry was posted in Current Affairs, Democracy & Citizenship, Economics & Trade, Politics & Public Policy, The EU and tagged brexit, European Union, four freedoms, free movement of people, frictionless trade, Single Market. Bookmark the permalink.